The aim of this study was to assess whether the amount of residual coronal structure and the type of cement used for fibre post luting (self-adhesive cement vs. composite core material) affected the four-year survival of root-filled premolars. 6, 12, 24, 36, and 48 months. Evaluation was performed independently by two blinded examiners. 120 patients (120 teeth) were randomised. There was no loss to follow up. than 50% of coronal structure and posts luted with core material had the highest 48-month success (90.0%) and survival rates (100%). 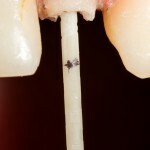 Conversely, the least satisfactory clinical performance was recorded for fibre posts luted with self-adhesive cement on abutments with equal to or less than 50% of coronal residual structure (success rate 63.3%, survival rate 86.6%). Clinical failure was mainly due to periapical lesions and post debonding, while root fractures were observed after 3 and 4 years of clinical service. The results of the present study implied that, over a four-year observation period, the risk of failure of endodontically treated and fibre-post- restored teeth increased with a lower amount of residual coronal structure. However, the clinical performance was not affected by the material used for luting posts, and similar results were achieved with self-adhesive resin cement and resin core material. The 2007 Cochrane review by Bolla et al which looked at the effectiveness of different post and core systems for the restoration of endodontically-treated teeth could only identify 2 randomised controlled trials which addressed the question. That review also called for more research to indicate which system should be used for different clinical cases so this new trial is welcome. However although there was no loss to follow up it is relatively small and may not have been sufficiently powered to show a different between the various system used. Juloski J, Fadda GM, Monticelli F, Fajó-Pascual M, Goracci C, Ferrari M. Four-year Survival of Endodontically Treated Premolars Restored with Fiber Posts. J Dent Res. 2014 Mar 19. [Epub ahead of print] PubMed PMID: 24646637.